This topic contains 15 replies, has 2 voices, and was last updated by danny weiss 2 months ago. The layout assumes the column is limited in size. Please, see a screenshot of the demo here. The column is around 47% until the mobile breakpoints kick in. Any idea how yours is 100%? The credit card logos aren’t ideal, if you send a link I can help with those. I use a multiple step checkout plugin which increases the width of that page. From the demo you sent I can see that the Paypal image is placed correctly on my website. The issue seems to be with the image showed by the card payment method. 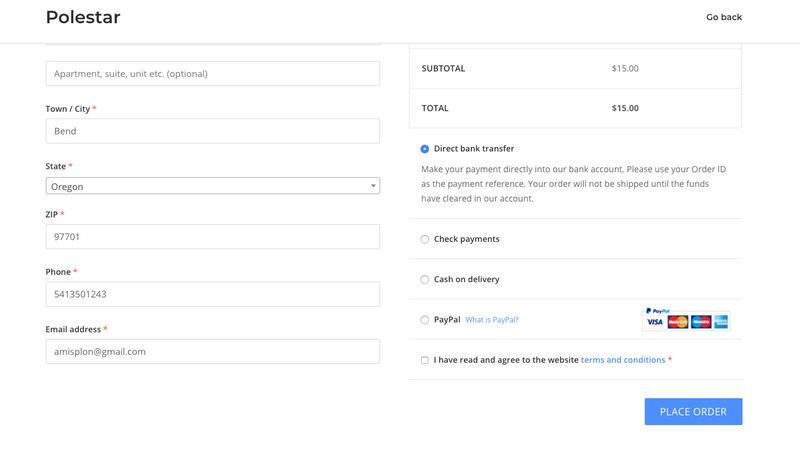 Also look at how the checkout page shows on mobile: https://ibb.co/XbXGJKs (it’s the default checkout, with that plugin disabled). The Paypal image overlaps some of the text. It would probably be best if we could push it below, this way it won’t be a problem anymore. Which gateway is handling the credit card option? For mobile, it isn’t easy. Just as with Stripe, there isn’t a wrapper around the icons so there doesn’t appear to be a simple way to drop them onto the next line. The first code aligns both payment logos to the right, which is great. And on mobile I think I’ll take your advice and just hide them using the last code. To update, switch to any other theme, delete Polestar and then install the ZIP from Appearance > Themes > Add New > Upload Theme. My Custom CSS above should replace yours for this change. Sorry for the late reply. I updated the theme to the version you provided and also added your code, however, while it fixed the issue on the Related Products section, it displayed the products on the Shop page on only one row (instead of two), which on a mobile screen is not great. So I added both codes, mine and yours, and now everything is perfect. Thank you again, you are truly awesome!! PS: I discovered some more issues with the theme, should I post them here as well? Thanks Danny. I didn’t realize you wanted two columns on mobile for the regular shop page. Nicely done on customizing that to your requirements. Which ever is easier, you can let me know here. Thanks. So, another problem that I discovered is that after entering the image gallery on a product page, when I exit the gallery, I’m automatically teleported to the bottom of that page. You can imagine that I have to scroll a lot to go back up, especially if it’s a longer product description with reviews and stuff. I use the default product image gallery, without an addon plugin. I couldn’t reproduce this on the Polestar demo website, because I couldn’t access product image galleries there. Does the issue persist on your end when viewing the above galleries?